The laws of physics are clear. The attraction exerted by bodies is directly proportional to the product of their masses and it is also inversely proportional to the square of the distance between them. This law is laid down by gravity in the universe. Zero gravity does not exist. There is always a celestial object somewhere which exerts some sort of attraction, even if it is thousands of kilometres away. Nonetheless, images of astronauts floating freely inside a spacecraft draw our attention and make us dream. The first thing that comes to mind is to think that there is no gravity there at all, but what they are really going through is a situation of constant free fall, like the spacecraft. Since both the spacecraft and the astronauts are moving at the same speed without there being any other force apart from gravity, the sensation they feel is of weightlessness. The example of the ISS (International Space Station) is quite descriptive. The station is moving at an average speed of 7.66 kilometres per second in an orbit around the Earth at an approximate altitude of 400 kilometres. At that distance, the ISS is subjected to a gravitational force of 0.9 g (8.83 m/s2), around 10% less than on the Earth’s surface. The astronaut inside the ISS is moving at the same speed as the spacecraft, but there is no force difference between them. The astronaut therefore feels he/she is floating inside the spacecraft. That is exactly what is felt in “zero-gravity” or parabolic flights. These flights follow a flying technique in which the aircraft takes a parabolic trajectory after a steep ascent, which allows the effect of an absence of gravity to be simulated during a few seconds (usually around 20 seconds). They are used to train astronauts or to conduct experiments in a weightless environment. They are also being increasingly used for tourism or leisure. For a modest price, anybody can sign up for a complete programme of activities with companies like Novespace, Zero-G Corporation or MiGFlug that culminates in doing a series of parabolic flights in an especially adapted aeroplane for such purpose, allowing them to feel the same sensations felt by ISS astronauts. These flight are, without doubt, a perfect combination of knowledge of the laws of physics, aeronautics and skill. The number of firms offering this kind of flights is on the rise. The main space agencies have already signed agreements with several companies to carry out these parabolic flights. There are also other firms which perform this kind of flights to provide a research environment of simulated weightlessness at a much cheaper price and more quickly than doing so on a space mission. 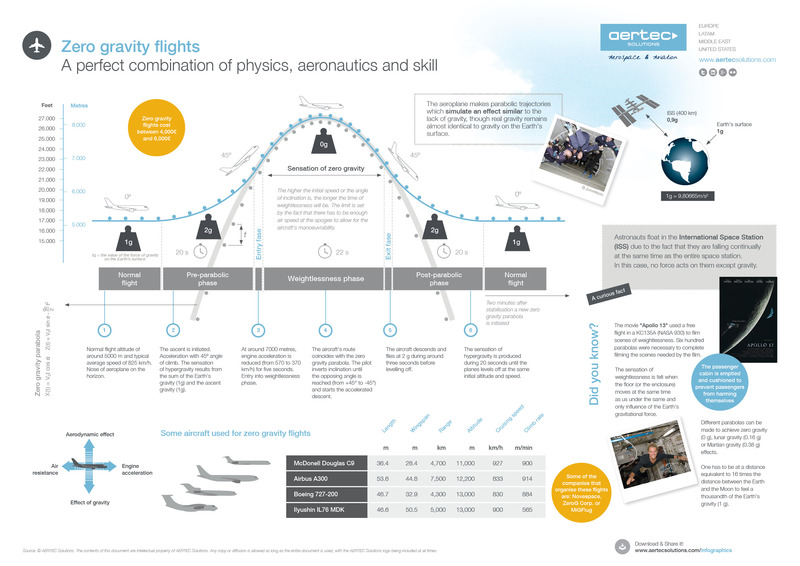 This infographic brings together some interesting data on “zero-gravity” flights, which we are sure will be of interest to you. Enjoy it and tell us what you think.